*Close to downtown Jackson. *START bus stop is right across the street! *Three levels with three separate entrances allows flexibility for a variety of groups. This Pitchfork condo is located at the base of Snow King Ski area (the town hill). This is about a 10-15 minute walk to downtown Jackson's restaurants and galleries. If you prefer to catch a ride into town, hop on the START bus across the street. Want to stay close to home for a few hours? Stretch your legs, play Frisbee or have a picnic at the Mike Yokel park across the street . Rock climbing and other activities are just down the street at the Phil Baux park. Summer or winter this is the ideal base camp, whether you are skiing Jackson Hole, Snow King, or Grand Targhee or touring the Parks and valley. Take advantage of your close proximity to Snow King's new mountain coaster (summer & winter), summit chair lift, and mini golf. Miles and miles of hiking/biking trails await you outside your door. Sit out on the deck and and enjoy a peaceful evening to the end of your busy day. With four bedrooms this vacation rental is ideal for two families to share! If you don't need 4 bedrooms, rent one of the sections separately and enjoy the same location. 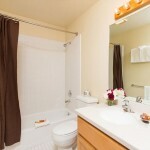 The unit provides plenty of space with 4 bedrooms, and 4 bathrooms on three levels. For your entertainment there is High-speed wireless internet, Cable Television in each bedroom and living room, and a DVD player in living room. For your convenience there is a Fully-equipped kitchen, Linens, Telephone, Microwave, 2 decks, Fireplace and firewood, Washer/Dryer. Bedroom 1: Top Floor ground entrance-1 King: bathroom in hallway Bedroom 2: Middle Level-1 Queen w/bathroom en suite Bedroom 3: Middle Level-2 Twins w/bathroom en suite Bedroom 4: Bottom Level-ground entrance-1 King w/bathroom en suite Lic. #6586-19 /services/short-term-rentals/ Cancellation policy: All cancellations will forfeit the 5% resort/processing fee. We require half of the rent, half of the taxes and the full processing fee at the time of booking (non-refundable unless property is re-rented). The remaining balance is due 45 days prior to arrival (non-refundable unless the property is re-rented). It was nice and it worked very well for us.